As the Syrian army moves towards completion of its task of liberating the entirety of the national territory, with Idlib now firmly in its sights, the waning of US influence and apparent preparations for the de facto withdrawal from occupation make it plain that imperialism is on the retreat. At the Helsinki Trump/Putin presidential summit on July 16, behind the usual talk about Crimea, pipelines etc., the real elephant in the room was the final collapse of Washington’s regime-change ambitions. Behind all Trump’s bluster about “safeguarding Israel’s security” and “curbing Iranian influence” lay the hard choice now facing the US: get on with it and withdraw now, or start counting the body bags marked Return To Sender, as old allies fade away and new enemies spring up. With the Syrian army closing in on Idlib, British imperialism has decided to pull the plug on its funding of the so-called ‘Free Syria Police’, unmasked last year by Panorama as under the control of Hayat Tahrir al-Sham cut-throats. A government spokesman told The Independent that “the security situation in Syria’s remaining rebel pockets means it is too risky to continue support for the Free Syria police force”. According to one ‘activist’ interviewed in the paper, “Along with the White Helmets [! ], the Free Syrian police is one of the best revolutionary foundations we established” (Bethan McKernan, ‘UK cuts aid funding for programmes in rebel-held Syria’, 21 August 2018). Now Britain’s investment in this anti-Assad ‘revolution’ (£152 million in the last financial year) has all gone down the pan, as the Syrian army turns up the heat on Idlib and London throws in the towel. Further tacit confirmation that it is all over bar the shouting comes from no less an authority than the Israeli Defence Minister. In a slimy backhanded compliment, Avigdor Lieberman suggested that the victory of the Syrian army could be good news for Tel Aviv, since President Bashar Assad could be worked with on security issues. He told journalists, “From our perspective, the situation is returning to how it was before the civil war [sic], meaning there is a real address, someone responsible, and central rule” (‘”Butcher”’ no more?’, RT, 2 August 2018). Whatever sick attempt at smart diplomacy underlay Lieberman’s remarks, what stood out was the frank admission that Syria has won the war, and any talks anybody wants to have concerning relations with Syria will have to go through the Syrian people’s chosen President and government, in short: “a real address, someone responsible, and central rule”. In reality, of course, Zionism takes no pleasure whatever in seeing Syria united, independent and gathering its strength as the refugees flood back to their homeland. But that is something it will just have to learn to live with, as will its US imperialist patron. At the joint press conference following the summit, Trump said that “Washington seeks Israel’s security, and cooperation with Russia and Israel to resolve the situation in Syria.” Putin in his statement made it clear that the “restoration of calm in the Golan Heights” could only be achieved “after the final elimination of terrorists in southern Syria” – terrorists whom, be it remembered, Israel has been happy to support (‘Possible US withdrawal hands Syria over to Moscow’, Enab Baladi website, 26 July 2018). Israel’s mass evacuation of White Helmets war criminals was but the latest instance of this criminal alliance. If Israel is truly concerned about ‘defending its borders’, it might do better to curb its enthusiasm for jihad. Meanwhile August saw UN peacekeepers patrol the Syrian side of the demilitarised zone (DMZ) in the Golan Heights for the first time since 2011, when al-Nusra terrorists chased them out. Now that the Syrian Arab Army and Russian air force have cleared out the rats, Russian forces have been able to facilitate the resumption of the UN patrol. Russia has set up five posts outside the DMZ to provide security (‘RT films abandoned UN checkpoints at Golan Heights’, RT, 14 August 2018). 2018 has seen the liberation by the Syrian Army of numerous areas: eastern Ghouta, eastern Qalamoun, the rural area in the north of Homs, and in Daraa itself. With every fresh advance by Damascus against the terrorists, the pretext for a continued US military presence wears ever thinner, raising the question of an exit strategy. It is interesting that, by one account, US forces sent a letter to anti-Assad factions holed up in Daraa shortly before the Syrian military offensive that liberated the city. The letter warned the jihadis not to expect any help from the US in resisting the government advance. The letter is said to have warned them not to “base your decision on the assumption or expectation of our military intervention” (Enab Baladi, op.cit.). This, if true, is doubly revealing, showing (a) the cosy relations with jihadis previously obtaining, and (b) the chill of those relations as full liberation looms and Trump hunts for the exit. This tale will strike a chord with the Kurds of the Syrian Democratic Forces (SDF) who have had a similar experience of fickle allies. Having been recruited as military auxiliaries, pursuing the US agenda in the east of Syria, seizing oil fields and getting in the way of the Syrian Arab Army, the Kurds found themselves left in the lurch in their hour of need. Washington abandoned the Kurds in Afrin, sitting on their hands as the Turkish army drove them out, then agreed a ‘road map’ with Ankara whereby the Kurdish People’s Protection Units were in turn shoe-horned out of Manbij. Given this record, it was not much of a surprise when, on July 16, whilst the Helsinki summit was going on, the so-called Syrian Democratic Council (SDC, the political wing of the SDF), recognising which side its bread was buttered on, announced that it would begin talks with the Syrian government, with plans to open offices in Damascus, Lattakia, Homs and Hama. It seems that the SDC Kurds have also tumbled to the fact that anybody with anything to say about the future of Syria will need to take it up with the legitimate leadership – “a real address, someone responsible, and central rule” – and stop looking to Washington for favours or deals on the side (Enab Baladi, ibid.). Given the reluctance of the Pentagon and parts of the Trump administration to row in with their president’s avowed desire to see US forces out of Syria “very soon”, one might even suspect that Trump came to Helsinki nursing a secret hope that Putin might prove an ally, helping smooth the way to an exit strategy. His own current preferred endgame appears to be to call on (unspecified) allies to take up the slack whilst US ground forces (numbering 2,200 officially) are gradually withdrawn from the north east over an eight month period, beginning in November 2018. Nipping at the departing army’s heels could be members of Iraq’s security forces, Hashd al-Sha’bi, seeking revenge upon the US after the destruction of their command and control position on the Iraq/Syria border by presumed Israeli jets (see Elijah J. Magnier, ‘US forces leaving al-Tanf’, ejmagnier.com website, 5 July 2018). The job of the centre had been to seek and destroy terrorists en route from Syria to Iraq. The entire justification for the (illegal) US presence in Syria has been precisely to deal with terrorism, but imperialism has been caught yet again obstructing those who really are serious about the fight against the jihadis. Baghdad is less and less reconciled to its role as bag-carrier for the US, and more than ever drawn by events into the struggle waged by the axis of resistance. Such wanton actions as the wilful destruction of Hashd al-Sha’bi’s command centre can only hasten this process. By giving aid and succour to the foreign terrorists flooding into Syria, imperialism internationalised its proxy war. But the consequence of this has been the corresponding internationalisation of the resistance too, with Syria receiving decisive fraternal assistance from Russia, Iran and Hezbollah. China too, as well as promising assistance with Syria’s reconstruction, has reportedly suggested some form of military assistance. Along with Chechens, Libyans and the rest, thousands of hardline islamist Uyghurs gravitated from China towards Syria during the war, with most of them winding up in Idlib province. Imperialism has long sought to stir up Uyghur hostility towards China, hoping thereby to weaken and disunite the country, just as it tries to do with a reactionary minority of Tibetans. Now that the Syrian army is getting ready to tackle the rancid stew of multi-national armed fanatics in Idlib, some reports suggest that China stands ready to lend a hand, not willing to see its national security threatened by a sudden influx of these traitors. 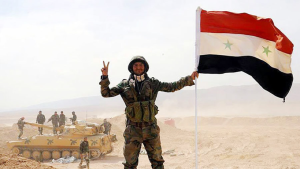 According to the Syrian newspaper, Al-Watan, the Chinese Ambassador to Syria, Qi Qianjin, has suggested that Beijing could soon deploy forces to assist the Syrian Army in its offensive in Idlib, as well as with other anti-terrorist operations. The paper quoted him as saying that the Chinese military “is willing to participate in some way alongside the Syrian Army that is fighting the terrorists in Idlib and in any other part of Syria”. The same paper quoted the Chinese military attaché, Wong Roy Chang, as saying that there is ongoing military cooperation between China and Syria, and that China wishes to advance its relationship with the Syrian Armed Forces (Suliman Mulhem, ‘China willing to assist Syrian army in Idlib offensive’, Information Clearing House, 5 August 2018). “The waning of US power and influence that Syria has both laid bare and hastened is a development that the policy community has given little thought to, because it was not supposed to happen. By every traditional measure of power, the United States, after all, has no peer. But power is only useful in its application, and Washington has proved either unable or unwilling to shape events in the Middle East as it had in the past—which is to say, it has abdicated its own influence… In Washington’s place, Moscow has stepped in to offer itself as a better, more competent partner to Middle Eastern countries. The era when the United States determined the rules of the game in the Middle East and maintained a regional order that made it relatively easier and less expensive to exercise US power lasted 25 years. It is now over” (‘The Syrian war is over, and America lost’, 23 July 2018). Who is winning right now are the thousands of Syrians who are now free to return to their towns and villages and begin to rebuild their lives relieved from the imperialist-sponsored terror of the past seven years. The government has established five points of entry along the Syrian/Lebanese border for the returning refugees, many of them women and children, where medics are on hand with food, medicines and psychological support. The deputy foreign minister, Faisal Mekdad, assured returnees that “Syrians living abroad, who have committed nothing against their fellow citizens, should fear nothing at all. The government will ensure their safety.” In contrast, Mekdad warned that terrorists should not anticipate any such warm welcome, stressing that those who fled Syria to escape retribution for “committing heinous crimes” will face prosecution, averring that the White Helmets (best buddies with cut-throat jihadis and choreographers of phony chemical attacks) “are criminals and should be treated this way.” (Needless to say, such impeccable credentials secured these ‘heroes’ first place in the queue for evacuation by Israel)! Whilst the UNHCR refugee agency chief, Filippo Grandi, suggests that “it is premature to promote return”, 25,000 have already voted with their feet and are taking back their homeland (‘RT films abandoned UN checkpoints at Golan Heights’, op.cit. ).